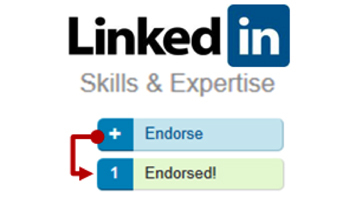 LinkedIn Endorsements are used on LinkedIn. LinkedIn, like any other social networking site, runs on the power of connections and your ability to make an impact on the minds of your peer partners. To make an effective yet resourceful impression on the minds of the people about yourself, endorsement is a very important tool. The feature was incorporated to make those skills and expertise, mentioned in your resume, stand out from the rest, making them remarkable, and define your work expertise better. This endorsement is more like an advertisement of you to promote your most-in-demand features. Now, endorsements are done by your connections and go a long way to attract the right set of recruiters or networking associates to review and recommend your candidature for their specific requirements. To get a better harvest or optimum exposure in the right direction from the endorsements you need to concentrate on a these factors. In the LinkedIn network, skills and expertise are like badges that to be flaunted around to catch the eye of the concerned recruiting individuals. To catch the eye best think of it as keywords that used in search engines by concerned parties. This will help you see that the best result is got when you look for the specific keywords instead of long sentences to describe your abilities. For example, small terms like blogging, resume writing, etc catch eye faster. Pick those skills that are widely in demand, defines you better and are easy to comprehend by your connections. These will get a better endorsement than those that few can relate to. Give the skills and expertise box the prime importance in your LinkedIn profile. Place it where it is spotted in the first glance in your profile. The reason is simple a better display gains you healthier number of endorsements and more visibility in that field of work level. You can pull the section to the top most rung on your page or also can keep it on the mid eye level to get the most appropriate positioning. Every job has a wide number of aspects that define many job criteria. So try to reinvent a wide number of related abilities and proficiency fields. Then juggle positioning these abilities depending on the need of the hour. The top 10 skills on your skill set of LinkedIn are the prime ones that recruiters look into while man hunting. Use this set fully and relate them to your pursuit in landing on our most favored job. You can seek out the people in your favored job type and then look through their skills to find out the relative ones and include them in your profile to get a better possibility. You can also hide the skills that are not relevant or pointless. This prevents others from seeing it and thus, no endorsements come this way. One of the prime standard business etiquettes are thanking back your peer or contact after their favors. In LinkedIn, the thank you is in the form of writing back an endorsement for those that have taken their valuable time off to click on yours. It has been a general truth to do good to others and only then expect them to do any good for you. The same logic goes a long way in LinkedIn endorsements too. You can also generate your own endorsements by rolling the ball from your court first. Take time to endorse your connections on their abilities and wait till they return you the favor. More often than not, studies reveal the facts that 85% of endorsements are received in this manner. If even after the effort you see no movement from the other side, you have two options. Either, to send across a message that you are looking forward to their good return or you can leave just as a lost connection. Not all favors are welcome when it comes to endorsements. When you are keen for a specific type of job or image projection, all your endorsements are not of equal relevance to you. As there is no Delete button in endorsements, the hide button takes importance in the screening. Social media consultants all over the globe recommend your liberal use of the hide button to switch off any unrelated or unsolicited endorsement on your profile. This way you get saved from a load of embarrassment or unease at thought of possible recruiters or influential HR coming across a wrong projection of your abilities. LinkedIn being an influential tool in your professional pursuits, the endorsements are just a way to generate an illustration of you in terms of your fields of expertise and gain you reputation for being who you are. Keeping in mind your professional goals you can use this tool to either enhance your business partnerships, keep pace with current industry trends or add value to your career in general. On both a personal as well as professional level, it creates a more dynamic social circle that more will want to be included in and thus expanding your territories beyond your own limited boundaries. About The Author: Alyssa. She is a writer/blogger. She writes articles on Technology, social media, WordPress, Gamification, luxury interior design, website development and online development etc. These days she contributes on luxury homes.